British architect Luke Lowings of Carpenter Lowings teamed up with American sculptor James Carpenter to create a stand-alone glass staircase to lie at the heart of his newly refurbished apartment. The staircase stands at an impressive 5.5 metres and fills the two-storey property. Structurally speaking, the staircase is made from heat-strengthened laminated glass and the parts are joined together by minimalistic titanium fittings. Each stair tread is made from three layers of glass and supported by just three fittings. The staircase in itself is impressive enough but when combined with the four-metre skylight above it, the result is simply stunning. The skylight allows a generous amount of natural light to spill into the apartment, enhanced by the extensive glass panels. The staircase appears seemingly weightless, which helps to create the feel of a floating structure. 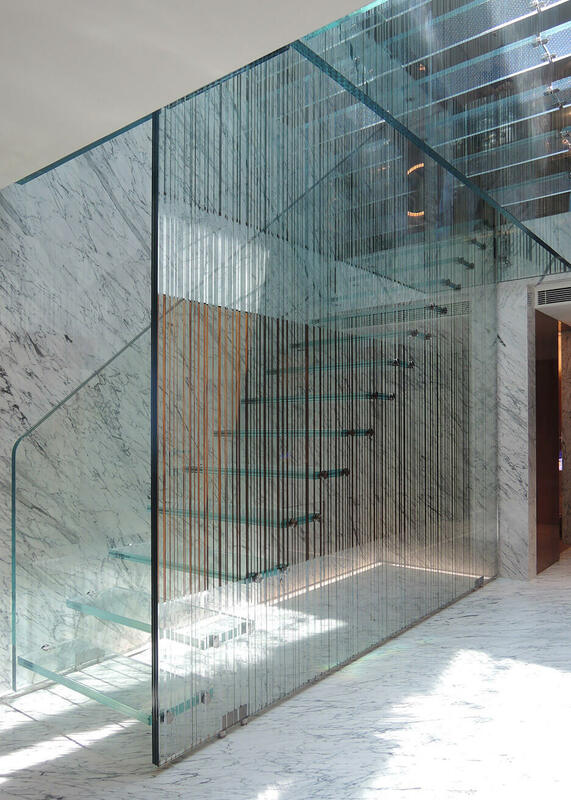 This unusual glass staircase is the stunning focal point of a recently-renovated New York apartment. While the visual concept of the new staircase that was created deserves recognition, we can’t help but be impressed by the hidden work that went into creating the structure. The staircase was specially developed to create a visually lightweight form. Inspired by the art of origami, the stairs are made from steel that has been folded into a wing shape. This shape gives the structure additional strength while reducing the amount of material required. For those who are familiar with the anatomy of a staircase, the cantilevered treads are connected to a single stringer, embedded and hidden in the existing structure. A glass screen lines the staircase and accentuates the lightweight feel. In terms of aesthetics, Apple is a company after our own heart. With bold glass features coupled with stone, timber and stainless steel, the interiors of their stores are often just as impressive as their technology. 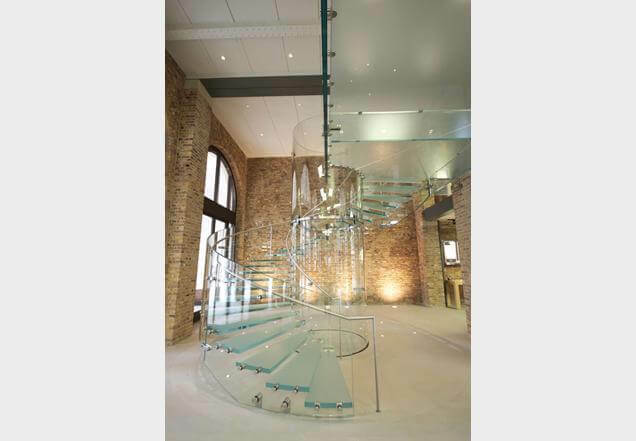 In particular, the glass staircase that lies at the heart of their Covent Garden store deserves a mention. Considering just how many people use that staircase on any given day, it has been designed with durability in mind. A special type of laminate is used to ensure that the staircase is as solid as possible and chip resistant. At 5-metres tall, the curved structure is made from no less than eight sections of toughened glass with a series of bolted holes and steel fittings to secure it in place. The stainless steel handrail that encircles the staircase gives it a totally modern feel. The design is relatively simple, but the combination of brick, natural light and glass gives a breathtaking and contemporary look. If you want to maximise natural light and space in your home, get in touch with us to discuss your glass staircase options.